In today’s IoT world, two things are abundantly clear. First, with the number of IoT devices expected to grow dramatically in the coming years — up to 31 billion in 2018 alone — the potential business opportunity is extraordinary. Second, only the fittest of businesses will survive. Want proof? Consider the sobering tale of one trucking company telemetry firm that made the decision to employ IoT modules in its day-to-day fleet activities. The company exhaustively tested its system prior to implementation, but did so under the assumption that the cloud server would always be present. Once in operation, the cloud server failed. Within 24 hours, the IoT modules had consumed so much cellular airtime trying to find the server that the company couldn’t afford to pay its network bill at the end of the month and was forced to close. At every step in the IoT product lifecycle, missteps like these can occur that hamper a business’s ability to compete effectively in the marketplace or derail its efforts altogether. One misstep product makers commonly make is underestimating the true cost of their IoT device. It’s a mistake with profound consequences on a business’s brand, image and profitability. Many think the cost of an IoT device is the price a user pays to own it. It’s not. Its true cost also includes the price of any maintenance and to find and fix errors and failures. If the IoT device is involved with processes of great value, as is the case with mission-critical IoT applications, then the cost of those errors and failures can be greater than the value of the device itself. A device selling for $10 could easily end up costing the product maker $1,000. That’s not a sustainable business model under any circumstance. Think of it this way: If a smartphone fails, the impact may affect one or two users. If mission-critical IoT devices fail, the impact may be much greater since those devices are often embedded in large, complex systems or in hard-to-reach locations. Just imagine a medical alarm in an elderly patient that fails to operate on the very day it’s needed to save the patient’s life. And what if there is a recall of an implanted medical device that fails? It might only require a doctor’s visit for a firmware update, but the faulty hardware could also have to be surgically removed and replaced. What about a failure in an IoT sensor that monitors temperature? It might cause a boiler to overheat, which is costly enough, but what if that sensor is used in an industrial cooler and its failure allows a dangerously high temperature that causes food contamination? The resulting costs could be substantial. Fixing these types of faults requires intervention from a technician. If the technician has to climb a ladder, go down an access hole or venture into a remote location or harsh environment, that fix can easily equate to 100s of dollars or more. For the product maker, these unforeseen expenses drive up the true cost of an IoT device, making it imperative that those devices be as reliable as possible. How does a product maker ensure their IoT devices are reliable? In a smartphone, users play a role by serving as unpaid technicians (see the Figure). They dutifully reboot their devices when they fail to connect to Wi-Fi. They download software patches to fix problematic updates. And they replace their phones without fuss when failures become too much of a nuisance. When it comes to mission-critical IoT devices, which must be 10 to 100x more stable and reliable than the standard $1,000 smartphone, this level of quality and reliability is, quite simply, not good enough. Avoiding these hidden costs and positioning a business to thrive in IoT requires one key thing of product makers and device manufacturers: test, and lots of it. IoT devices in mission-critical applications must be properly tested to ensure reliable performance, even if that testing is more expensive than the device itself. The challenge is that IoT devices operate in very different environments. They may be mounted in the air, down a hole or against concrete or metal. To ensure they will work as expected, they must be tested after final assembly and under conditions that simulate real-world deployment. By measuring a device’s important performance indicators under normal operation and with production-release software, product markers can catch any potential flaws before they have the chance to drive up the IoT device’s true cost. Various approaches can be employed to perform this testing, such as using a golden radio, paired devices or parametric testers. If a less complex, more cost-effective system is desired, an IoT device functional tester can do the trick. Which approach is utilized will depend on the product maker’s specific situation and requirements; however, selecting one that features test automation software can be a dramatic time and cost saver. The internet of things is ripe with opportunities for those businesses fit enough to overcome its challenges and sidestep its pitfalls. 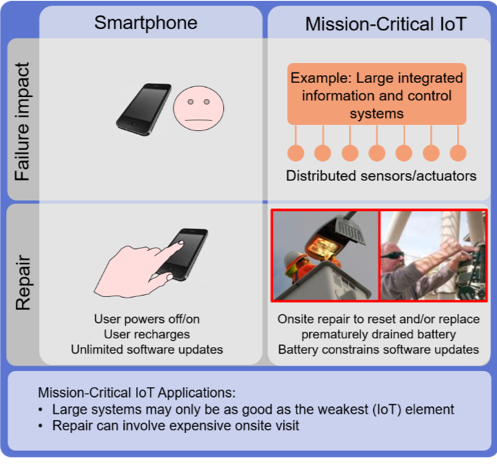 Understanding the true cost of an IoT device is one pitfall product makers can avoid by employing adequate manufacturing and development test to improve product reliability. It’s a smart investment for any business looking to make its mark in the rapidly growing IoT industry.